The University of Ulster’s Belfast campus has been transformed into the city’s biggest art gallery this week as new graduates showcase their top class talent. The School of Art and Design and the School of Architecture and Design will throw open their doors to the public for the spectacular End of Year Show, which will run until this Saturday. Four floors at the York Street campus will be turned into an art lover’s paradise, adorned with unique pieces of work spanning every discipline from photography to fashion and architecture to art. On display will be challenging sculptures and eye-catching prints, high-trend fashion and exquisite jewellery, animation successes and communication solutions, all created by artists poised to embark on their new careers – and much of it on sale to the public. As visitors move from floor to floor, their senses will be bombarded with the amazing display of colour, form, texture and images in the virtual world. Debbie Fraser, Associate Head of School of Art and Design, said: “There has been much talk and debate recently about the Creative Industries and here at the University of Ulster’s Belfast campus we are making it visible and tangible. “Not only is this a chance for the University to celebrate its talented new graduates, but it gives visitors the opportunity to become owners of unique new art work while investing in the next generation of artists and designers. “This is also a fantastic opportunity for individuals to see what goes on in our campus and find out more about what we offer in full-time, part-time and short courses. The show opens each day from 10am until 5pm, with a late night on Thursday until 9pm. For more information contact Debbie Fraser on dea.fraser@ulster.ac.uk. 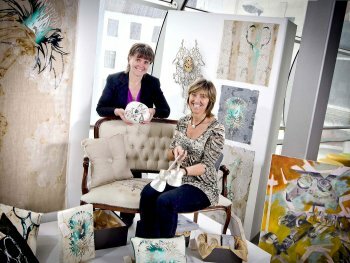 Caption:Barbara Dass, left, Head of School of Art and Design, and Debbie Fraser, Associate Head of School Art and Design, with work from this years Final Year Degree Shows. Work pictured by Textile/Print Artist Ciara Connolly, Painter Lyn Megaw , Ceramic Artist Danielle Cochrane, and Metalsmith Eilish McBride.